Ever had the sensation that the floor gave way under your feet? When thinking up a new model for the first meeting of SELMEC in January 2019, I decided to start earlier than I normally do which was just before Christmas, meaning that for a change I did not have a frantic rush to have to come up with an idea and create it all in a few days. I started building it on the 15th of December 2018 and was very satisfied with myself when I completed it just eight days later, giving me the Christmas period as a well deserved break. The model is based on a fairground ride sometimes called Aladdin's Carpet or The Magic Flying Carpet, which is a rotating platform ride were riders sit in two front-facing rows whilst the platform falls away and rises back up in circular movements like the hands of a clock in fast-forward. In fact this was in a way a re-visit to an effort I once built in 2012 which I called the Wave Rider which encountered operational problems whilst performing the required rotations and was eventually dismantled not having achieved the smooth operational movements that would have made it satisfactory. As such, it has always been a challenge I set in my mind to one day set right. Back in October 2018, I was in Blackpool and one of these themed amusement park rides on the pier was in full action when I noticed that behind each of the rotating attachments to the drive motors there was a heavy counter-balancing unit which steadied the movement very precisely, and I came away from it with the desire to finally take on the challenge which I had long put on hold and it wasn't too long after that I set about building my new model. As in the real ride, I set about using two similar counterbalances with one on each side which certainly did help in the steadying of the rotating movements, but on each rotation there was an unwanted jerking action that I can only describe by saying that something was trying to jump. After all my new inspiration I still faced the same spoiling problem of the smoothness of operation that I was desperate to achieve, and I was not happy to find myself back in the same situation as I had been in my previous effort some years ago, and it felt kind of symbolical to have the 'carpet pulled under my feet' sensation once more. Determined though not to be beaten this time, I put a lot of thinking into resolving my dissatisfaction, trying different adjustments until finally by adding four small strips to the unit the motion became almost perfect. 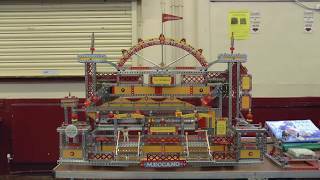 That is the magic of Meccano though, which makes it such a great hobby; you know you can always keep developing your ideas and finding new ways of making your ideas to come to life.